The Civilian Conservation Corps camps were well equipped with all necessary tools and equipment, and enrollees were given the opportunity to learn how to use them safely. Alfred E. (Irv) Nelson wrote about the work done at Rabideau, Camp 708 near Blackduck, Minnesota, and recounted how dangerous it could be. "After they had their breakfast and made up their barracks, the boys were all mustered out in the muster area and then the Forestry would assign crews and men to different sites and different jobs." "Oh, they went out building roads, planting trees, road cleanup, surveys, fighting fires of course, and general forestry work - some cutting wood to bring back for the Army for cooking and heating." "Well, when it got down to a certain degree below - I don't just recall what it was - I believe it was around 30 degrees. Why then they wouldn't send us out unless it was something that just had to be done. They'd keep us in camp if it got too severely cold." "At the school they had a safety class that all of the rated men had to attend, and it was optional for some of the rest of us to attend these safety meetings. Well, we had a first aid class for the rest of us, but the rated men and foresters all had to attend this class once a week on safety and they were very safety-minded and we went through with a minimum of accidents. Some of them couldn't be helped - we had as I recall one of the boys lost his hand - he ran it into a belt on a saw rig and he lost the use of his entire arm but it pulled his hand out at the wrist. At that time it was one of the most terrible things." "It all belonged to the Forest Service and we had very good tools. We had our boys who kept them all sharp and took care of them. They were checked out to you, and you checked them back in, always with your name on. They were charged to you. Course they had cross-cut saws; they didn't have any chain saws or anything like that. 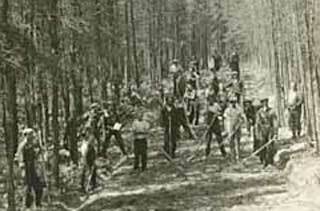 The only power saw we had was a gasoline saw rig that they sawed up the blockwood for heating the camp. Shovels, axes, cross-cut saws, cant hooks, PVs, comealongs, and hand tools of about every kind and description. They had a very thorough set of tools." 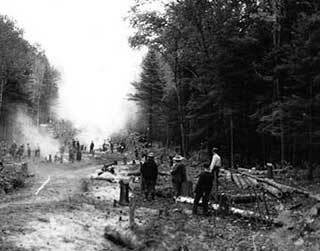 Civilian Conservation Corps workers building road near Roosevelt, 1933. Civilian Conservation Corps fire fighters in northern Minnesota, 1933. 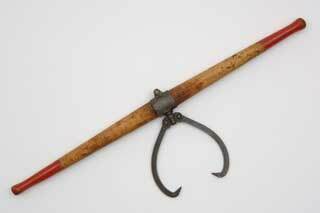 Brush hook used by the Civilian Conservation Corps, 1933-1942. 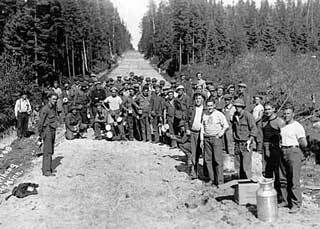 Photo: Civilian Conservation Corps Company 1761, building a road near Bemidji, ca. 1935. Photo: Roadside cleanup by Civilian Conservation Corps, 1939. 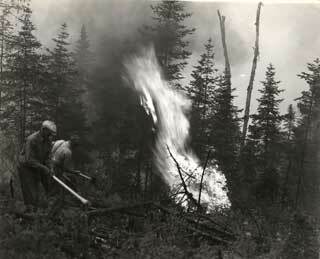 Photo: Civilian Conservation Corps fire fighters, northern Minnesota, 1933. Object: Cant hook used by the CCC, 1933-1942. 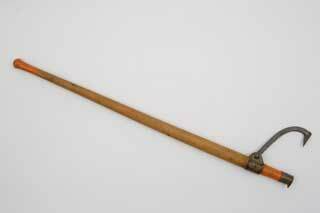 Object: Peavey tool used in lumbering, ca. 1900. Nelson, Alfred, E. (Irv); Stanley Johnson, Interviewer, Oral History Interview. MHS Oral History Collection, 1976.